On Sunday, June 26th from 3:30 to 5:30 PM, Bastille, located at 606 N. Fayette Street in Old Town Alexandria, opens its patio up to our furry friends. 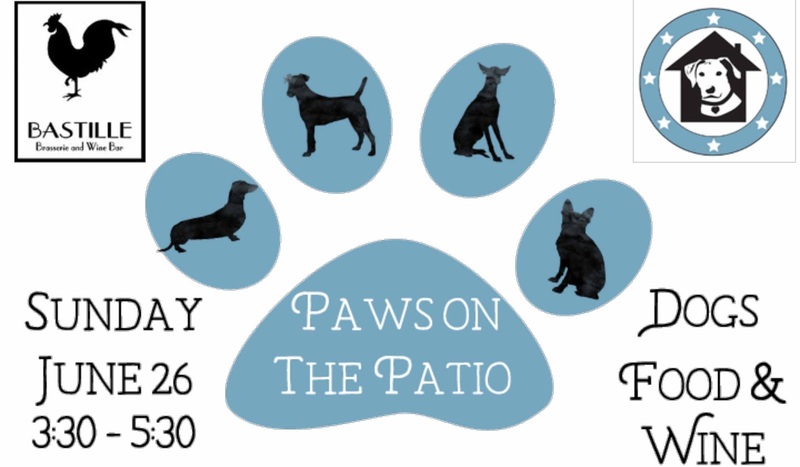 Paws on the Patio is a family and pet friendly Sunday afternoon Happy Hour on Bastille’s expansive private patio just a block from the Braddock Road Metro. As special guests, Bastille welcomes adoptable doggies from Operation Paws for Homes, who rescue dogs of all breeds and ages from high-kill shelters reducing the numbers being euthanized. Most of their dogs come from rural shelters in South and North Carolina, as well as Virginia. They also partner with local shelters as needed. The organization provides pet adoption services to families located in Virginia, Washington, DC, Maryland, Southern Pennsylvania and neighboring states. 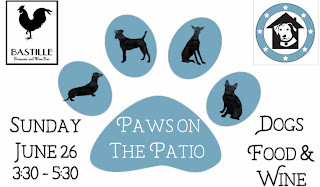 A portion from the proceeds of Paws on the Patio will be donated to Operation Paws for Homes. It's the perfect opportunity to give a forever home to a deserving pet and make a difference to the life of an animal in need. Bastille’s special menu will include Warm Marinated Olives; Duck Fat Popcorn; Shrimp Beignets with spicy guacamole; Frog “Wings” with smoky espelette, Roquefort, celeriac, carrots, arugula; “Pommes Frites aux Fromages” - French fries, Cheddar sauce, Raclette cheese, and crispy prosciutto; Pasture-raised Virginia Angus Beef Burger with lettuce, tomato confit, and crispy onions. Prices range from $5-9. All draft beers are $5 with specialty brews ranging from $5-6. Wine and cocktails are also available. Bastille is now open Monday through Saturday from 11:30 AM until 10 PM and Sunday 11:30 AM until 9 PM serving brunch, lunch, dinner and all day dining with café and bar menu offered. The restaurant is located in The Asher at 606 N. Fayette Street in Alexandria, Virginia. For reservations and further information, please log into www.bastillerestaurant.com or call (703) 519-3776.